Searching for quality apartments in Pune and have everything ready for the purchase? Buying a sophisticated residential space in Pune city is not a difficult task at all as a number of leading real estate developers to have their world-class constructions in this city. For investment purposes, Kharadi is a great location having all the modern resources and advanced infrastructure. This region is located strategically in proximity to the important areas in Pune including Viman Nagar, Kalyani Nagar, Wagholi, Magarpatta etc. This region provides great value appreciation to the investors as prices are constantly rising in this area from the past few years and the upcoming years will bring more growth and development here, therefore, a massive rise in property prices are most obvious here in the coming years. Kharadi is a prosperous IT hub of Pune city having many leading IT multinational who are running their businesses from here and have their local branches and offices in this region. Several talented young professionals are doing here white-collar jobs and there are countless other shining opportunities and new openings are still waiting here for the right candidates that deserve these jobs. Business opportunities are also available here and as the region is very prosperous, advanced and developed, the future of different types of businesses looks very great here. Not only the settled businessmen but also the newcomers are earning huge profits here by setting up their new businesses in this region. Infrastructure facilities are quite developed and advanced here and there are some biggest shopping complexes in this region with several other entertainment zones and recreational facilities. The educational level of this area is best and it has some of the city’s best and renowned schools and educational institutes including colleges, universities and coaching centres etc. The region is famous for providing the best medical facilities in the city as several multi-speciality hospitals lie in this locality. Apart from that, connectivity and other facilities are also brilliant here and a well-connected network of smooth and rapid roads in this area provide seamless connectivity to the travellers. Kharadi is well-connected to the airport, major railway stations and important IT hubs and financial districts in the city. 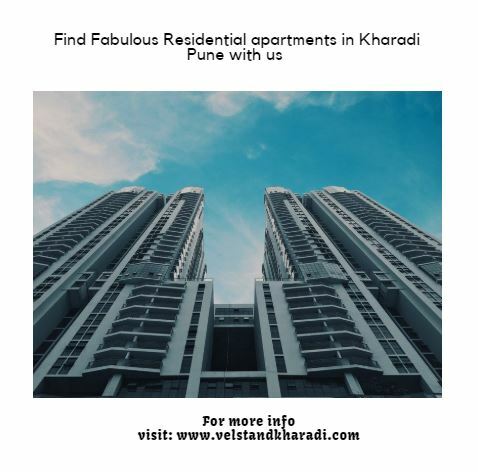 So, if you are planning to invest in residential properties in Pune or are finding wonderful living spaces in the city, Kharadi is one of the best options available in the city. For long term perspective, Kharadi is an advantageous realty hotspot in Pune city. Equipped with outstanding features and lifestyle luxuries, Royal Velstand is the new masterpiece in the luxury housing segment of Pune city. It has extremely beautiful 2, 2.5 and 3 BHK modern apartments which are magnificently designed with astonishingly superb interiors. The sizes of these ultra-luxury homes varying from 89 sq. mtr. to 123 sq. mtr. You will experience ample cross ventilation in these Vaastu homes for proper daylight and fresh air. You can commute anywhere in the city very smoothly from Royal Velstand. It comes in proximity to several public and social facilities and utilities. Prices set here for the new bookings are very genuine and quite comparative which range from INR 88.78 lakhs to INR 1.20 crores. Come here to join the magnificent luxury section available here. The major features in this section here include video security, swimming pool, clubhouse, kids’ play area, gym, landscaped garden, power backup, lifts etc.